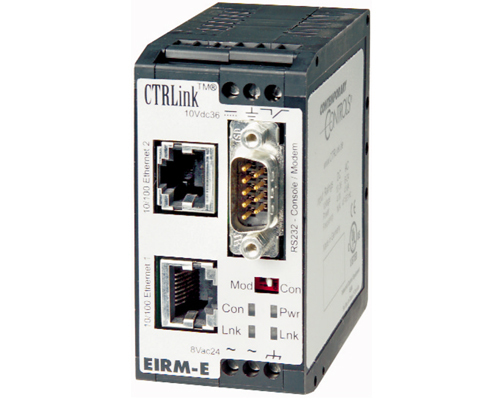 The CTRLink Mini-Router offers a simple and easy interface between the Ethernet-based automation solution and the company network. With the help of IP masquarading and network adress translation the device can conceal the structure of the automation net behind only one IP address. The RS232 console can be a connection to an external modem (ISDN, GSM or analogue) and can give safe access to the internet (for example for remote servicing). An integrated firewall provides increased security to the network. The Router provides name resolution for the network. It is set-up by a Web-Browser or by Telnet. Palms and Laptops are possible to use. No additional configuration software is necessary. Functions like DynDNS and Call Back are available by default.